Instantly see the add/drop scenarios that will improve your roster. Quickly see which available players will improve your team, and by how much. See how a move impacts your lineup in each scoring category. Find out which available players are valuable to your opponents. What is the Waiver Assistant? Once your league is imported, we analyze the available players in your league and present the best options based on expert rankings and projections. This helps you quickly identify players that may be beneficial to your team, and allows you to compare how much your team may improve (or worsen) based on potential drops from your active roster. How do I get the Waiver Assistant? The Waiver Assistant is part of the premium package for My Playbook. 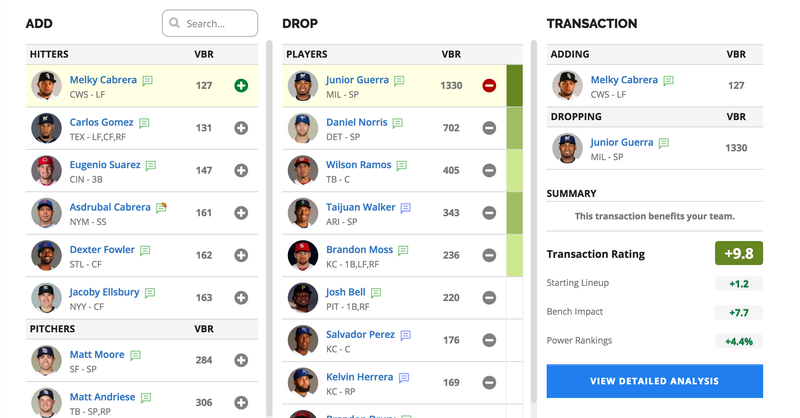 This package also features support for custom scoring and multiple league imports along with additional tools to help you dominate your fantasy baseball league: a Lineup Assistant, League Analyzer, Trade Analyzer, Trade Finder and Research Assistant. My Playbook is our in-season assistant that lets you import your league from Yahoo, ESPN, CBS, RTSports, and more. It only takes a few seconds to import a league and it’s FREE. You'll get instant advice based on your roster, along with matchup ratings and projections for your team.